How many accessories can we mount to our guns? Answer: All of them!! If you are completely impractical maybe, but for us minimalists, less is more. I think that I have said it before when speaking about lasers…hold tight…you’re about to hear “it” again. Shooting with them, has never been part of the wheel house that has been shooting for me. Until recently we stumbled across Lasermax and some of their products that were intended to be and have turned out as force multipliers in the defense and tactical shooting realms. The Spartan line of mountable light/laser combos have recently found themselves attached to the frame of my range pistols. The Spartan is different from any other illumination device we have come across. One AAA battery powers both light and laser; and for quite some time too. The mint green light spews out 120 lumens, which does not seem like a lot compared to some similar mountable lights, but with its mint green hue, the light offers a broad range flood, using a fraction of the battery power and to top it off, after extended periods of use, the lamp doesn’t get so hot you could fry and egg on it like we have experienced with other lights. Other mountable lights are capable of bellowing 300-500 lumens of white overpowering light that proves to be adequate but any chance of maintaining photo adaptation aka; your eyes natural night vision is blown. LaserMax has cracked the code of capitalizing on the most visible wavelength in the color spectrum with the Spartan laser/light combo. The Spartans green visible laser is both crisp and deliberate. 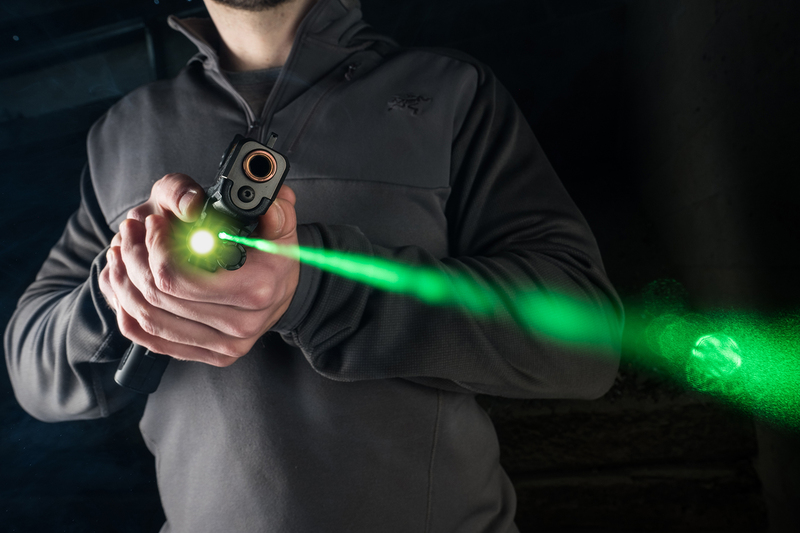 Though it is grossly unrealistic to engage a target with a pistol from this distance, the green laser is visible for 100 yards at night with very little ambient light. We could not test this product without witnessing how far the laser would stretch out to. We mounted the Spartan onto a Springfield Armory XD mod 2 for our testing procedures. The light mounts to any picatinny rail by two allen key bolts and LaserMax’s advanced mounting technology that maintains the low-profile design, yet fits between the short axis of whichever rail you are mounting to keep the device secure through its hard end use. Ergonomics play a key role in the practical application of virtually any product, especially when it comes to tactical use. Its activation switch for both laser and light are conveniently located just forward of the trigger guard which makes the device exceptionally easy to activate in either mode. The Spartan is programmed with a continuous on and pulsating strobe for both laser and light. With one push of the on switch we quickly illuminated our intended targets. For the sake of testing from a home defense perspective, we strategically moved throughout our house, similar to what we would do in the event of an intruder. The Spartan threw off enough light to adequately illuminate a 15x6 foot hallway, and a 20x30 great room with no other lights on. Due to range constraints and out of respect for neighbors, we did not have the chance to test the light with live rounds outside at night. We ran the Spartan through series of drills during the day to test against deactivation due to recoil. Another complaint we have had and heard with other light/laser combos. We ran the XD through our typical testing with the light on and at no point throughout hammered pairs, failure drills and an occasional “mag dump” did the light turn off or even flicker. Everything we have tested and seen with the light component of the Spartan holds up to our standard of hard end use. Lasers on pistols, an acquired taste at best. Some will ask the question “if you have your pistol raised and your eyes are behind your sights, why not just use them, instead of looking for the end of a laser beam”. We have asked the same question many times. Especially with the 120-lumen light of the Spartan, just pick up the front sight and drill your target. What about for contact shooting? A style of defensive gun fighting that if you’re not careful you will end up shooting holes in ceilings as seen recently with a how-to video circulating online. Should you not have the distance or space to bring your pistol to a full presentation, taking a contact shot or as some would call it, “hip shooting” may be the only option in getting effective rounds into your intended target. Having a single point of reference such as a green or red laser would be your best option vice nothing at all! LaserMax Spartan has an intuitive on click switch that comes textured for low/no light identification. It is the first switch you are going to push with your finger as you come out of the holster or bag. Should you need it, switching the laser from solid to pulse is easily achieved with an exaggerated 3 second hold of the on/off switch. Throughout our testing, the green laser remained clear and concise regardless of distance or how big or small the target. Obviously the closer the target the larger the dot and more distorted it becomes, albeit very clear throughout. Adjusting the laser was simple and virtually effortless. For practical sake, we adjusted the windage and elevation screws to set the dot or lasers end on top of our front sight post. Some would suggest zeroing the laser at the universal 25 yardline. We adjusted to our point of aim/point of impacts at 10 yards. Doing this, we noticed roughly 6 inches of impact shift the further we moved from our IPSC cardboard target. We like to set our guns and equipment up to be as conducive to real world scenarios as possible. Truth be told, we will not be using the laser, or light anything outside of 10-15 yards. Lasers more than lights often teeter on the hate or love fence with little room for sway. We have identified the absolute need for rail mounted lights across every spectrum of tactical firearms. 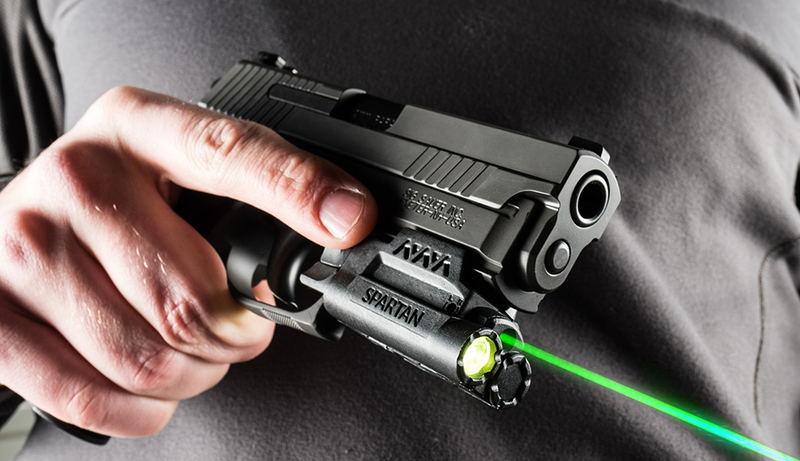 The Spartan is a one device fits all (pistols) solution to lighting and the option for lasers are there should you wish to add another tool to your shooting “tool box”. Our immediate concern with his new light/laser combo, comes the holster dilemma. We have been set up for so long with one type of pistol light that our holsters reflect them. We are not saying that these holster or lights are obsolete, but what we are saying is that we will have to make room for additional holsters to fit the Spartan. LaserMax currently does not offer a holster option for the Spartan however, there are plenty of holster pros out there to accommodate. High Threat Concealment, Safariland, Crossbreed, Tier 1 Concealed and Galco are a few of our favorites that have found themselves at the top of our EDC and tactical hard end use “Go To’s”. Keep in mind that you may need to be patient and wait a couple weeks with some of the plastic bending manufacturers. Rest assured that you will have a quality product once it comes UPS or FEDEX. We have yet to be disappointed in dealing with any of these manufacturers and the products we expect out of them. Other than working through our own hold ups for lasers and the reluctance to change our training strategy and methods, this laser is one that we will use to train with and add to our toolbox. The shear ergonomics alone offer advantages that many other lasers do not. There tactile on/off switch is conducive for deliberate function instead of having a light ND commonly found with grip activated switches. It was abundantly clear that during the design process of the Spartan LaserMax considered the size and weight concerns that many other manufacturers do not, without skimping on adequate lumens. The Spartan is low profile and weighs next to nothing yet still throws out enough light to get the job done.